After a period of service on the light cruiser Königsberg as an officer cadet, Prien obtained his full commission, and was transferred in October 1935 to the U-boat force (Ubootwaffe) at the rank of Leutnant zur See in what had now become the Kriegsmarine. He was almost immediately placed on the U-boat training course, along with a number of others who were also to go on to be some of the most successful U-boat commanders, among them Joachim Schepke and Herbert Schultze. The training department, at that stage officially titled the school of anti-submarine warfare (Unterseebootsabwehrschule, or UAS), had on 6 June 1935 been placed under the command of the then Kapitän zur See Karl Dönitz. The boats used were type IIA and IIBs. For his training, Prien found himself on the U-3, one of the new Type IIAs. Left: Having endured the labour gangs, Prien evetually found his vocation in the Reichsmarine, which was to become the Kriegsmarine. He is pictured here at the time he held the rank of Oberfähnrich zur See. Right: Prien (top right) with his fellow officers aboard the Type IA submarine U-26. To his right is his skipper Werner Hartmann. Hartmann was to have an astonishing career in the service: he skippered three boats, sank 26 enemy vessels, and his final patrol as skipper of Type IXD2 U-198 lasted a staggering 200 days, for which he was awarded the Oakleaves to his Knight's Cross. At the end of the war Hartmann had reached the rank of Kapitän zur See, and went on to serve in the post-war Bundesmarine. The training that U-boat crews had to undergo was thorough to say the least; a veteran submariner himself, Dönitz applied himself to his task with both innovation and vigour, applying a number of strict fundamental principles in a well-organised, intense programme. It was the thoroughness of this training programme that was to produce the highly skilled commanders and crews that only a few years later were to take to the seas and strike fear into the opposition. The thoroughness of the training was exemplified by the number of practice attacks a trainee crew had to make before even being permitted to fire a live torpedo - a staggering total of 132 manoeuvres, 66 of which were submerged and 66 while surfaced, using shots of compressed air known to the crews as "water slugs". Every technique and trick in the book, as well as a number of new ones geared towards overcoming improvements in enemy anti-submarine technology such as the feared ASDIC system, were learned thoroughly by Dönitz's fledglings. Within two years of beginning his U-boat training Günther Prien was promoted, attaining the rank of Oberleutnant zur See on New Year's Day 1937. During the following year Prien was stationed on the experimental Type IA boat U-26 as a watch officer under Kapitänleutnant Werner Hartmann, picking up valuable "real time" experience patrolling in Spanish waters during the Spanish Civil War. 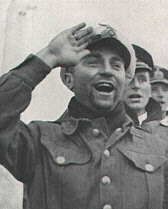 Hartmann was a particular admirer of the young officer, who in addition to being meticulous, thoroughgoing and dedicated to his profession was also an highly personable individual who could keep eager listeners enthralled with a vast array of stories about his ventures around the world as a merchant seaman. Sometime in 1939 before the start of what was to become the Second World War, Prien married his fiancée Ingeborg. According to what Prien "said" in the ghost-written autobiography Mein Weg nach Scapa Flow, he had met his future wife after supposedly mistaking her for someone he had met sometime earlier in the city of Plauen in the Vogtland. However, in various interviews after the war Prien's widow discounted the account in Mein Weg nach Scapa Flow as pure fantasy. A happy married life was not going to last long however - for war was just around the corner. On 17 December 1938 at the rank of Oberleutnant zur See, Prien was given command of the Type VIIB U-47, the most junior officer to be given command of one of these newer, more advanced vessels. This was not without justification: Prien had been highly rated by his superiors, making his mark during the Atlantic "war games" of May 1939 where he had been the most aggressive and achieved the best results. On 1 March 1939 he was promoted to Kapitänleutnant. Günther Prien. Left: Taking the salute after another successful patrol. Right: On the bridge. When war broke out in September Kapitänleutnant Prien was to make his mark as the first U-boat commander to gain a successful sanctioned kill* on his first Atlantic patrol, with the sinking of the British steam ship Bosnia on 5 September 1939, a mere two days after the opening of hostilities. Prien conducted the attack with a chivalry that was often shown by the U-boat aces: after the British vessel had refused to heed verbal warnings, it was attacked with deck gunfire. Not before having the crew of U-47 assist the Bosnia's survivors by bailing out their capsized lifeboat, Prien allowed its stricken crew to be picked up by a neutral Norwegian ship before finally sending the steamer to the bottom of the Atlantic with a torpedo. No-one was killed during this attack. Prien's first skirmish was to yield a total of three victims, the sinking of the Bosnia being followed by the successful attacks on 6 and 7 September against the British freighters Rio Claro and Gartavon. Once again, the crews were allowed off their stricken vessels and allowed to progress in their lifeboats before U-47 delivered the coup de grce. The eventual sinking of the Gartavon was particularly eventful: after the crew had taken to the boats, the crewless freighter steamed in an arc towards U-47. After U-47 had dodged the ship, a single torpedo was fired to sink her. After the torpedo jagged off course and passed wide, the decision was made to sink it with shells from the 88mm deck gun. U-47 safely returned to port on 15 September, and ten days afterwards Prien was awarded for his exploits with the Iron Cross second class. From then on the war hardened with every day. The British began to arm their merchant ships and send them in convoys. We acted accordingly. Every vessel in an enemy convoy was liable to be torpedoes without warning and we worked according to the formula: Any ship in convoy to the bottom. *The first actual sinking of an enemy vessel by a U-boat during the war was the steam liner Athenia, mistaken for an armed merchantman and sunk by U-30 under the command of Kapitänleutnant Fritz-Julius Lemp.